Home Tech The Samsung Galaxy A6 & A6+ are now available in stores nationwide! The Samsung Galaxy A6 & A6+ are now available in stores nationwide! Samsung's latest midrangers are tempting buys. Samsung is lighting up the midrange smartphone market with its latest smartphones, the Galaxy A6 and A6+. These new phones feature elegant designs and equally impressive displays. The Galaxy A6 and A6+ are available today in Samsung stores and partner retailers nationwide! 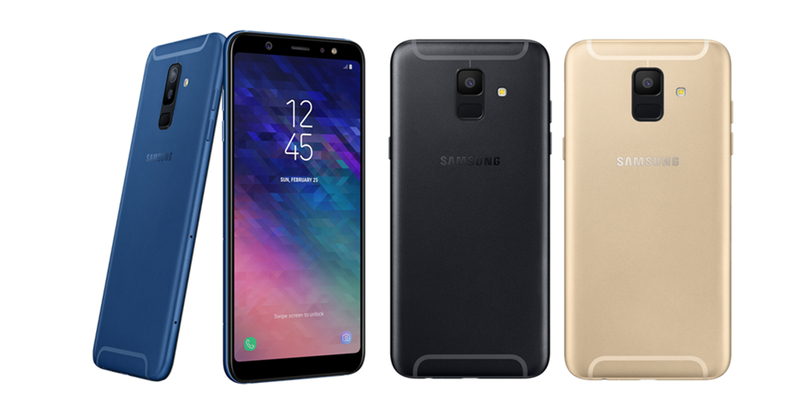 The new Samsung Galaxy phones are designed to stand-out with their full-metal unibody designs and eye-catching colors, including an all-new Blue shade. Complementing their elegant designs are the Super AMOLED Infinity Dipslays that Samsung packed in the A6 and A6+. With AMOLED displays, these phones will produce vibrant colors, perfect for media-viewing. The cameras of these phones are also impressive. The A6 packs a 16MP resolution front and rear camera, while the A6+ comes with 24MP front camera and a 16MP + 5MP Professional Dual Camera. Samsung’s virtual assistant, Bixby, is also included in both phones, enabling users to get more things done on their device. The Samsung Galaxy A6 & A6+ are now officially available in the Philippines today with a suggested retail price of PHP 16,490 for the A6 and PHP 22,990 for the A6+. The Galaxy A6 comes in black and gold, while the Galaxy A6+ comes in black and blue color options.